Failing to make your bed in the morning may actually help keep you healthy, scientists believe. The bugs, which are less than a millimetre long, feed on scales of human skin and produce allergens which are easily inhaled during sleep. The warm, damp conditions created in an occupied bed are ideal for the creatures, but they are less likely to thrive when moisture is in shorter supply. The scientists developed a computer model to track how changes in the home can reduce numbers of dust mites in beds. Researcher Dr Stephen Pretlove said: "We know that mites can only survive by taking in water from the atmosphere using small glands on the outside of their body. "Something as simple as leaving a bed unmade during the day can remove moisture from the sheets and mattress so the mites will dehydrate and eventually die." In the next stage of their research, the scientists are putting mite pockets into beds in 36 houses around the United Kingdom to test their computer model and will investigate how people's daily routines affect mite populations. Building features such as heating, ventilation and insulation will also be altered to monitor how the mites cope. 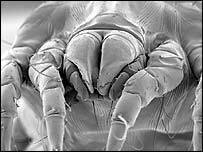 Dr Pretlove said the research had the potential to reduce the £700m spent treating mite-induced illnesses each year in the UK. "Our findings could help building designers create healthy homes and healthcare workers point out environments most at risk from mites." Dr Matt Hallsworth, of the charity Asthma UK, said: 'House-dust mite allergen can be an important trigger for many people with asthma, but is notoriously difficult to avoid." Professor Andrew Wardlaw, of the British Society for Allergy and Clinical Immunology, agreed. He said: "Mites are very important in asthma and allergy and it would be good if ways were found to modifiy the home so that mite concentrations were reduced. "It is true that mites need humid conditions to thrive and cannot survive in very dry (desert like) conditions. "However, most homes in the UK are sufficiently humid for the mites to do well and I find it hard to believe that simply not making your bed would have any impact on the overall humidity."